We do everything we can to ensure that the Certified Pre-Owned vehicle you purchase will perform like a new Mazda.But we realize that sometimes, for whatever reason, you may wish to change your vehicle after you’ve purchased it. That is fine. If you are not 100% satisfied with your vehicle, you can return it within 30 days or 3,000km of purchase (whichever comes first). No hassles. No worry. No problem. You can exchange it for another Mazda Certified Pre-Owned vehicle at the original dealership you purchased it from. We’re sure you’ll love your Certified Pre-Owned Mazda. 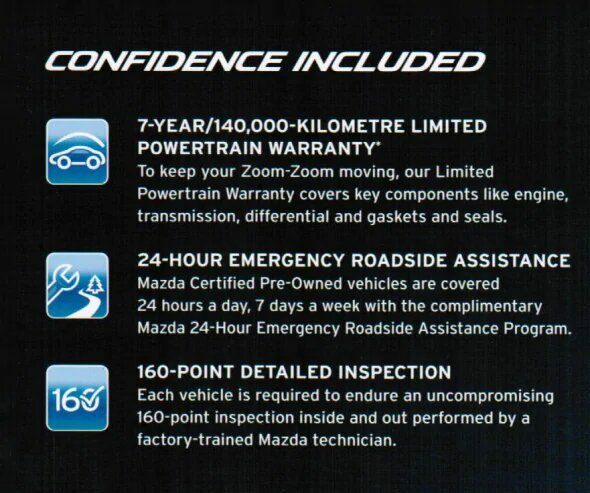 With the Mazda exchange privilege, we back it up with a guarantee. See dealer for complete details. you can return your Certified Pre-Owned Mazda within 30 days or 3,000km. Whichever comes first. will be subject to a vehicle inspection, not eligible for exchange if there is more than $300 in damage and/or excess wear and tear. As a Mazda Certified Pre-Owned customer, you are automatically enrolled inour 24-Hour Emergency Roadside Assistance Program for the entire duration of your certified warranty. This unique program is designed to take care of you and your vehicle should the unexpected happen on the road. If your vehicle breaks down or has a flat tire, or if you’re locked out, you can call us toll-free 24 hours a day, 365 days a year. We’ll do everything necessary to get your car back o the road. One phone call is all it takes. Chances are you’ll never need us, but it is nice to have the confidence of knowing we’re there. For emergency roadside service and towing to the nearest authorized Mazda dealership, call 1-877-416-2932 or 877 41MAZDA. You can call this number 24 hours a day, 7 days a week, from anywhere in Canada or the Continental USA.